Wonderful Hoarding | The Messy Palette . 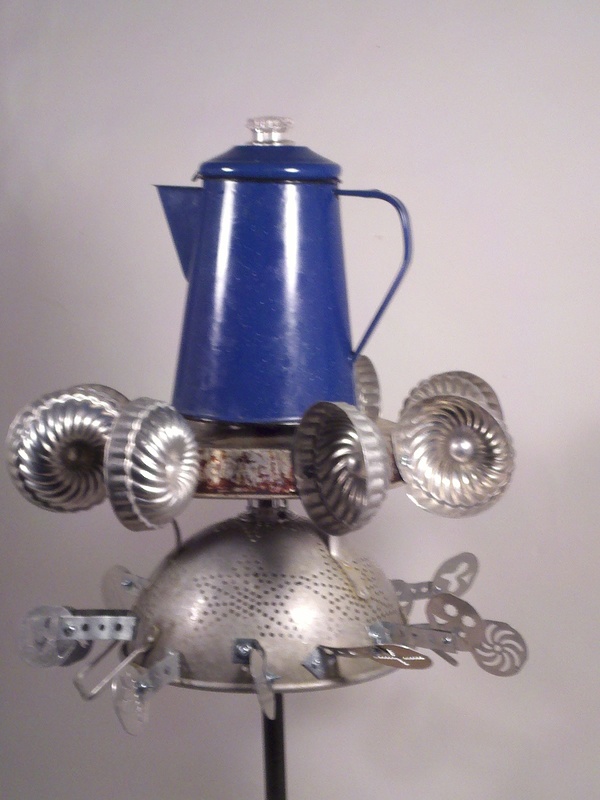 . .
Our daughter, Laura, made this whiligig at a workshop near her home in Washington State. 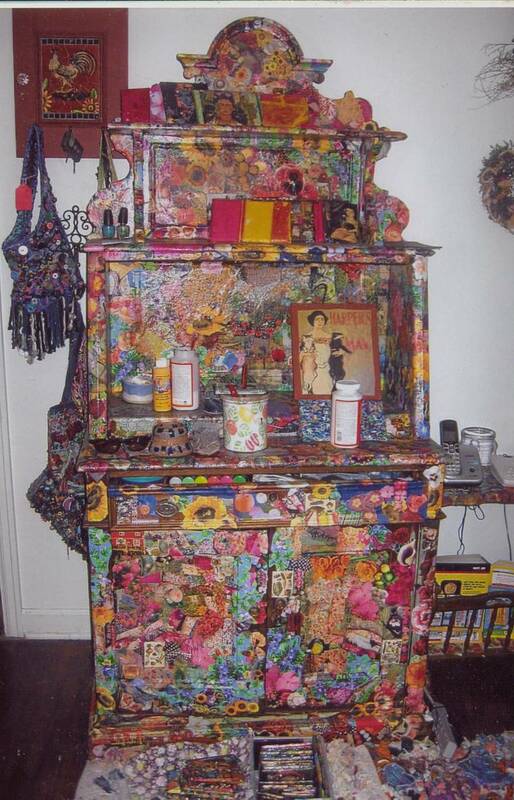 The beauty is a composite of treasures culled from rummage and estate sales in her area. Those of us who enjoy junking are NEVER BORED—and we’ll probably never be tempted to go off the deep end financially with our passion for collecting, because the stuff we prefer doesn’t normally cost that much. The items we love best are those which many folks disregard, discard, and even look down their noses at. These people don’t get it. They’re missing a huge chunk of abundant living to be found in foraging garage sales, scrap yards, and curbsides! Now that rummage season is in full swing, our joy cups run over on a regular basis. We come home from a morning of foraging renewed, refreshed, and super charged with creative ideas as to where we will place, or how we will use, our newly acquired treasure. One thing is certain: where junkers are concerned, there are no two homes alike. Our decor is highly individual. It can be simulated, but never cloned! 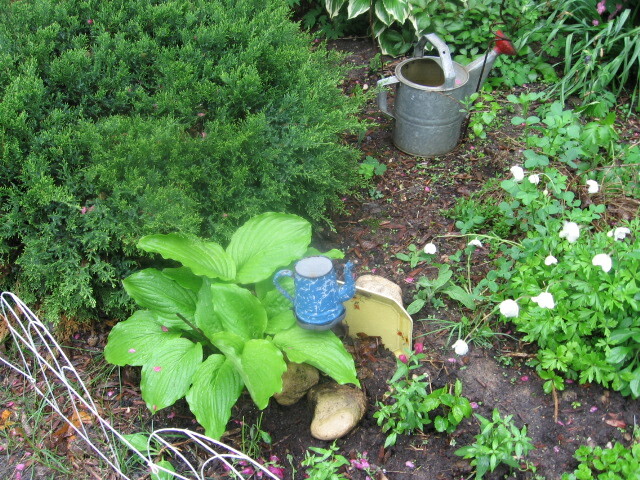 ↑ The small blue granite pitcher peeking out of the Hosta is mounted on an upside down lamp base from one of those derelict “Made in China” lamps which, after 2 years of use, tend to become electrically unsafe. The base (hidden in the photo) was too pretty to discard, so I cut off its cord and glued my vintage blue pitcher on its bottom. Behind the pitcher is a broken, circa 1930 plate. I never discard broken china or pottery, as it can always find a pleasant home among my garden or house plants. 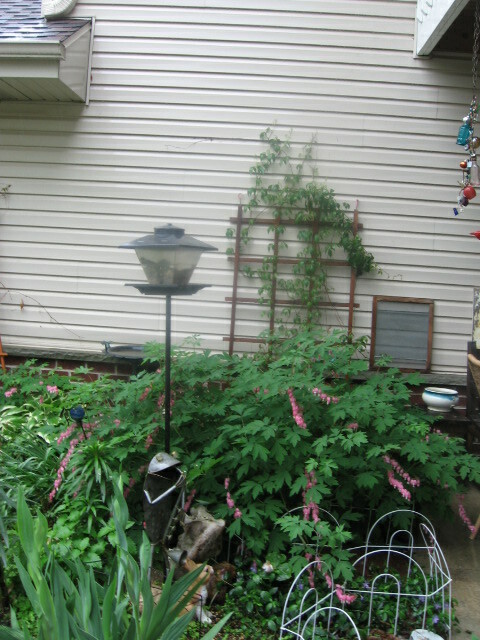 ↑ A saxophone playing frog leans against the bird feeder, with our mutant Bleeding Heart providing a background. Froggie was actually a new purchase, a gift from our daughter Laura. Note the Virginia Creeper creeping up the trellis—one of my all time favorite vines, also called Woodbine or Englemann Ivy. It’s indestructable in our northern climate. More damaged pottery rests on a handmade-by-Joe bench on the right as you view the photo. ↑ A closer look reveals the frog’s companions: a bunny and a skull from the Southwest, reminiscent of artist Georgia O’Keeffe. 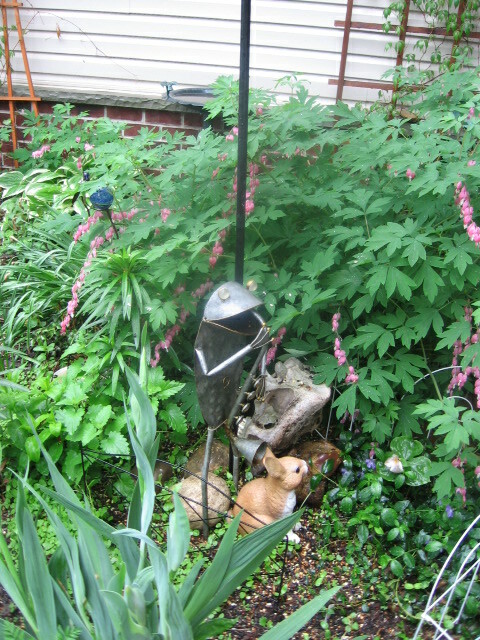 ↑ The hangy thingy next to the hummer feeder was assembled by a local artist who has a business called FUNKY FINDS. You can see the tops of a couple of old screens. Screens and shutters with chipped, peeling paint are always welcome—indoors or out. One can never get enough of those! 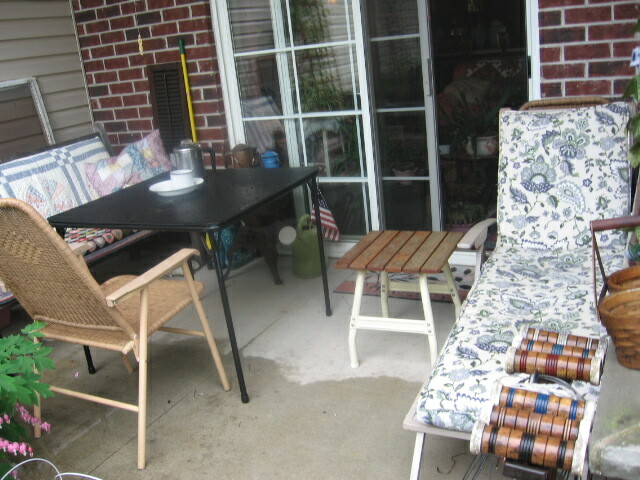 ↑ Here is our patio, right off the living room so that we savor a year ’round indoor/outdoor atmosphere. The patio is the setting for many lazy spring, summer, and autumn days spent sipping iced tea, reading, snoozing, and cloud gazing. The patio faces east, so that we can sun bathe in the morning and rest in the afternoon shade. This picture was taken in a downpour. The card table gets covered with a lovely vintage cloth on sunny days. It also serves as a place for my art equipment and afternoons of sketching and painting. The smashing antique croquet set was a rummage sale treasure which cost $5.00. It has all its mallets, balls, and arches—with an old rag tied to each arch. We can take the croquet set up the berm to the park, just a few yards away, for killer games. Upon all the evidence, I rest my case! Junk is wonderful! Frontal Lobes and Happy Genes! A few years back my KOVEL”S ANTIQUE COLLECTOR’S NEWSLETTER told of a study at the University of Iowa which indicated that collectors have damaged frontal lobes. Actually, I think the study focused on folks who save decades of empty cereal boxes, plastic refrigerator dishes, and stacks of newspapers. Those of us who collect English teapots, Teddy bears, and vintage kitchen kitsch may be exempt from such a dire (and seemingly ridiculous) judgment. Nonetheless, those of us who do enjoy our collections find the “damaged frontal lobe” diagnosis to be hilarious. If we are “damaged”, so be it. We are contented, adventuresome, and never bored! Environment may play a part in our hobbies and activities, but genes are also involved. My parents were collectors. However, their tastes were a bit more limited (and perhaps more refined?) than mine. I have taken the gene thing to a new level. One of my nephews and a daughter share the collector’s gene with me—as well as at least one granddaughter. More grandchildren may surface as they become mature adults. Even I was once a minimalist, until something snapped in my early thirties and I never looked back! It takes maturity to discover exactly whom we are and what rings our chimes! Another, similar gene has been passed down in my family: the passion for creating way out, funky stuff. The Brits, who love to turn verbs into adjectives, call people like us, “makey”. Would the “experts” at the U. of Iowa determine that we eccentric makeys have damaged frontal lobes as well? It seems that collecting and eclectic creating are related, at least in my experience! The first truly makey person I know of in my family was my Aunt Lois, although there must have been pioneers before her. Aunt Lois was born in 1900. I’ve blogged about her before, and I probably will again as she was a true mover and shaker in my life. I think of her nearly every day! Lois’s funky spirit first went on display when her husband taught at Berea College in Kentucky, and she immersed herself in mountain arts and crafts. From there, Lois and her husband moved to California. Need I say more than that? I only saw Lois a few times in my life, in the 1930s and 40s, when she would return to Wisconsin for a visit and breeze in wearing the most interesting hand-made costumes. Maya Angelou has called such garb “get-ups”. My Aunt Lois was the Queen of the Get-ups. I found Lois to be inspiring and wonderful.—not only her shawls, capes, and hats, but her entire persona. She was full of smiles and excited descriptions of whatever craft she was into at the time. 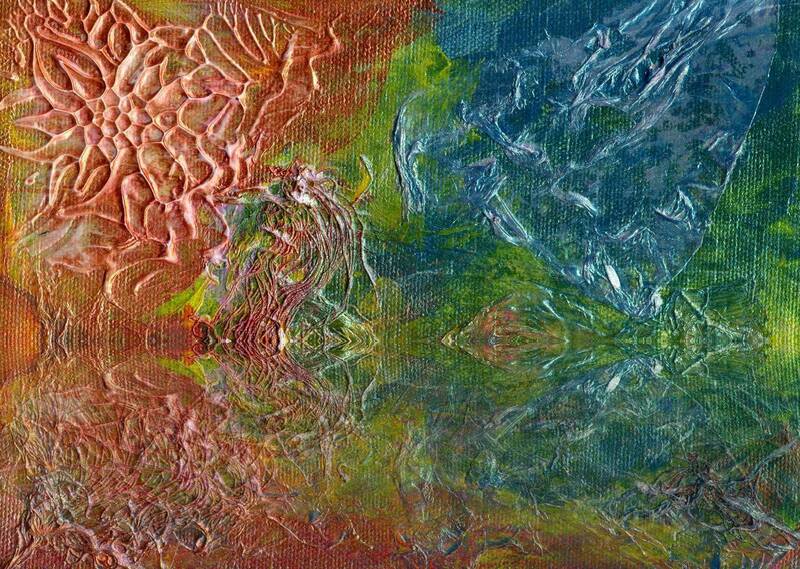 She eschewed patterns and rules in her art. Lois was an original. Although not a hippie in lifestyle, she had that free creative spirit which would explode in wild, wonderful color generations later—the very wild, wonderful color that permeates my life and home. I’m pleased to carry the Lois gene, and I have a niece in Colorado who has the gene as well. I don’t think my niece ever met Lois, but the makey stamp is there—plain as the words I’m keyboarding at this very moment. It just occurred to me that the makey gene has been passed from aunt to niece, and then again from aunt to niece. I wonder what Aunt Lois’s aunt was like! I’d like to see an MRI image of her frontal lobes! Indeed, it is SPRING! My heart pulsates to the music of cardinels, redwings, robins, mourning doves, sandhill cranes, Canada geese, and other skyward signs of the season. There is another sign—or rather a plethora of SIGNS—which soon will pop up in yards all over the little communities in our vicinity. They may vary in wording—RUMMAGE SALE, GARAGE SALE, ESTATE SALE, YARD SALE, or whatever. But these signs all mean the same thing: absolute, abject BLISS! Well I am having the last “HA”. We had scarcely unpacked our 280 moving cartons last fall when we discovered that we were smack dab in prime rummage country, and we dug right in—always coming home from a Saturday morning foray with one more thing to stick in a bare spot somewhere. Now we are relishing the realization that rummages will resume, any moment now. There is alway room for more STUFF—somewhere, somehow! I call it “uncondo-ing the condo”. Sometimes I don’t know which I enjoy most—the treasure hunts resulting in adding fresh decor to our home, or the raised eyebrows and eye rolling of those folks who “just don’t get it”. 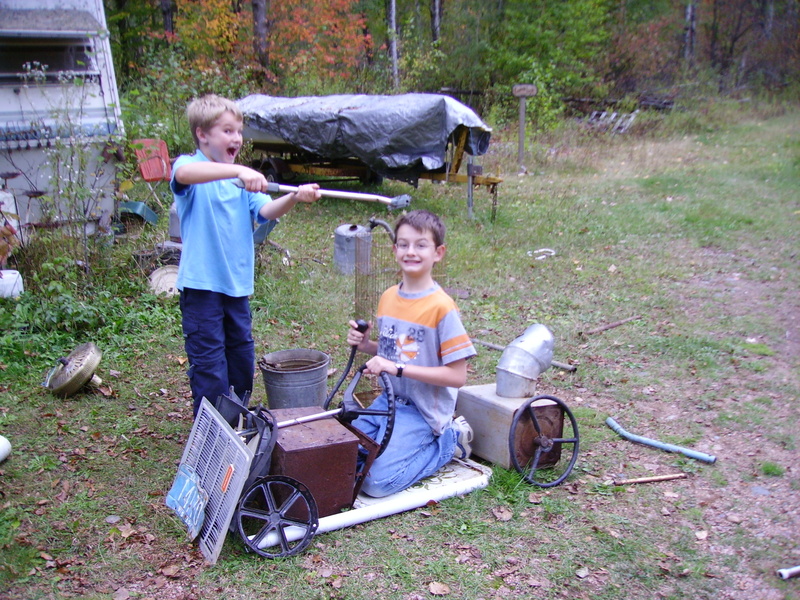 When people unversed in the joy of junking visit our home, they look perplexed—even distressed. But most fun of all, are those few individuals who “do get it”. They may be practically strangers in terms of longevitiy of friendship, but something snaps when they enter our home. These kindred spirits move quietly from room to room, wall to wall, and corner to corner—studying every detail with intense interest. Appreciation and a sense of freedom are written on their faces. Appreciative visitors experience THE GREAT AHA as they wander through our home as if it were a museum. They know that, when it comes to interior decorating, “MORE IS MORE”. There is a nasty word out there, for those of us who love rummaging and junking. We are called “hoarders”. Never mind. We are a mighty army of individuals who find beauty in things that the trendy folks cast off. We are a brigade of non-materialistic “materialists” who value things for their sentimental implications, memories evoked, funki-ness, and unsung beauty rather than for their status or price. You will not find the latest and most fashionable in our homes (or on our bodies, for that matter). 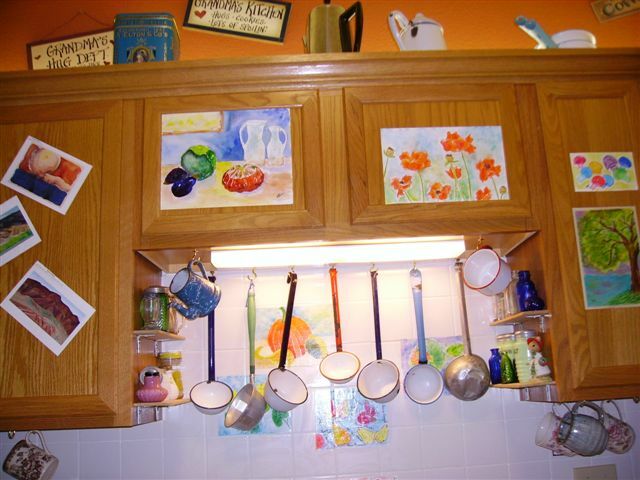 But you will find the most fun in our lives—as expressed in our homes and personalities. We are never bored—always alive to whatever we see, hear, smell, touch, or imagine. We are an esoteric sorority and fraternity bonded by our enjoyment of stuff. We share a priceless gift of creating beautiful arrangements comprised of whatever the trendy people throw away. Maybe we collectors are hoarders: hoarders of dreams, memories, and fun. Hoarders of pizzazz and panache unearthed in everyday life! Hoarders of quality of life! But unlike the quintessential hoarder in fact and fiction, we junkers are hoarders who share! We love to share our home, our stuff, and our joie de vie with whomever will slow down long enough to appreciate! So here’s to my “sisters and brothers” in JUNK: Karen, Betty, Judy, Alicia, Sandy, Barbara, Julie, Andy, and countless others. Here’s to author/photographer Mary Randolph Carter and her wonderful junk books which keep me vicariously and happily junking even in winter.